The 10th day of the Israel Defense Forces (IDF) "Operation Protective Edge" featured a five-hour ceasefire to allow humanitarian supplies to reach people in Gaza. The ceasefire was violated by rocket launchers in Gaza, who fired three projectiles into Israeli regions in the south. Before the ceasefire took effect, Hamas sent 13 heavily armed terrorists, carrying RPGs and AK-47 assault rifles through a tunnel from Gaza into Israel, where it is believed they wanted to attack a nearby kibbutz. Unlike past conflicts with Hamas, this Israeli operation – which is aimed at extinguishing rocket fire on Israeli cities – is slow-paced and deliberate. This approach enables the security cabinet and military planners to carefully examine the developing situation, set targets, and decide on their next move without a great deal of pressure. 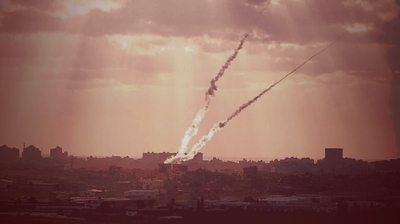 This atmosphere, considered conducive to decision-making during war, is possible thanks to the dazzling success of the Iron Dome air defense system (10 batteries are currently in operation – double the number that were deployed during Israel's 2012 clash with Hamas). Israeli military sources say that Hamas initiated the conflict due its growing regional isolation, which began when Hamas's ideological twin and founding movement, the Egyptian Muslim Brotherhood, was ejected from power in Egypt last year. Hamas' crisis has grown ever since. Through a conflict with Israel, Hamas hopes to ends its isolation, reenter the Palestinian mainstream as a "hero," and secure a cash flow for its 43,000 members on the payroll, or risk seeing its Gaza regime sink into a sea of anarchy and debt. But Hamas' decision to launch a war against Israel has backfired. The Arab world has largely given it a cold shoulder, and Hamas' military wing in Gaza, the Ezz Al-Din Al-Qassam Brigades, is growing weaker by the day due to Israel's military blows. Israel's Air Force and Navy have launched nearly 2,000 strikes on Hamas and Islamic targets in this operation, delivering a series of painful strikes, and knocking out many underground rocket launchers. An estimated 3,000 rockets (a third of Gaza's arsenal) have been destroyed, as well as command and control centers, while around 100 Hamas and Islamic Jihad field operatives have been killed. While Israel's firepower has been highly effective, Hamas' has been the opposite, due in large part to the Iron Dome air defense system. Hamas and other organizations fired 1,400 rockets into Israel since the start of the operation. Of those, Iron Dome knocked out 272 that were heading toward high-population centers. More than 1,000 rockets fell in open, sparsely populated areas, and a few caused heavy damage to Israeli homes and injuries. One man was killed Tuesday. Air power alone is not enough to achieve an all-out victory. Many of Hamas' nerve centers and rocket launching infrastructure are hidden deep underneath civilian buildings – targets that Israel refuses to strike for fear of harming Palestinian noncombatants. Even in the midst of the fighting, the IDF is keeping a close watch on Hizballah in Lebanon, acutely aware that Hizballah is returning the same watchful gaze. On the one hand, Hizballah is likely highly aware of the fact that the IDF dropped heavy bombs on the homes of Hamas's battalion and brigade commanders – structures that doubled up as command centers. The message to Hizballah seems clear – it, too, will face devastating firepower in the event of a conflict and its attempt to plant assets in the middle of civilian neighborhoods will not prevent that outcome. Hamas and Hizballah are both experts at guerrilla-terrorist asymmetrical warfare, and both convert densely-populated civilian regions into rocket bases. They convert mosques and residential buildings into command and control centers, and bunkers dug under homes into rocket storage facilities. In terms of firepower, Hizballah's rocket arsenal is more than 10 times greater than Gaza's. With 100,000 rockets in Hizballah's possession, including missiles with warheads of hundreds of tons, which have ranges of several hundred kilometers, the current pattern of conflict between Hamas and Israel cannot be replicated by Jerusalem in the event of a full-scale clash with Hizballah. Some of Hizballah's projectiles can bring down whole buildings. Israel does not have enough air defenses to cope with Hizballah's rocket onslaught, and the David's Sling system, designed to shoot down heavy Hizballah rockets, is not operational. Even if that changed, Israel's defense budget would not allow for the creation of sufficient numbers of interceptor missiles to deal with the level of firepower that Hizballah has amassed. According to Israeli estimates, the Lebanese terror organization is number five in the world in terms of its firepower (Israel is number two).